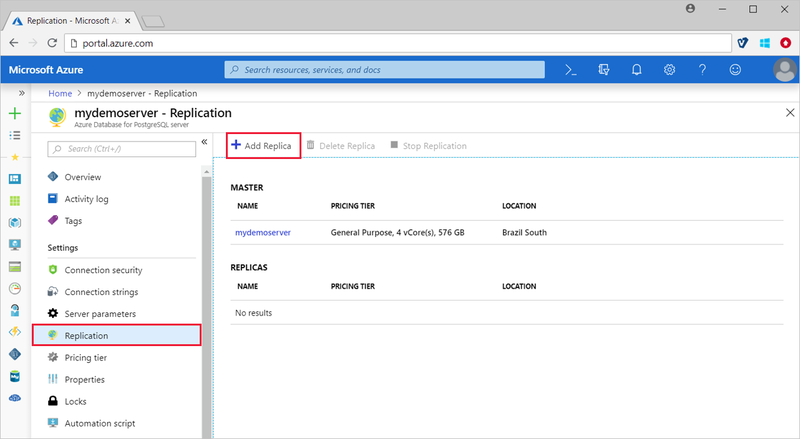 In this article, you learn how to create and manage read replicas in Azure Database for PostgreSQL from the Azure portal. To learn more about read replicas, see the overview. An Azure Database for PostgreSQL server to be the master server. These steps must be used to prepare a master server in the General Purpose or Memory Optimized tiers. The master server is prepared for replication by setting the azure.replication_support parameter. When the replication parameter is changed, a server restart is required for the change to take effect. 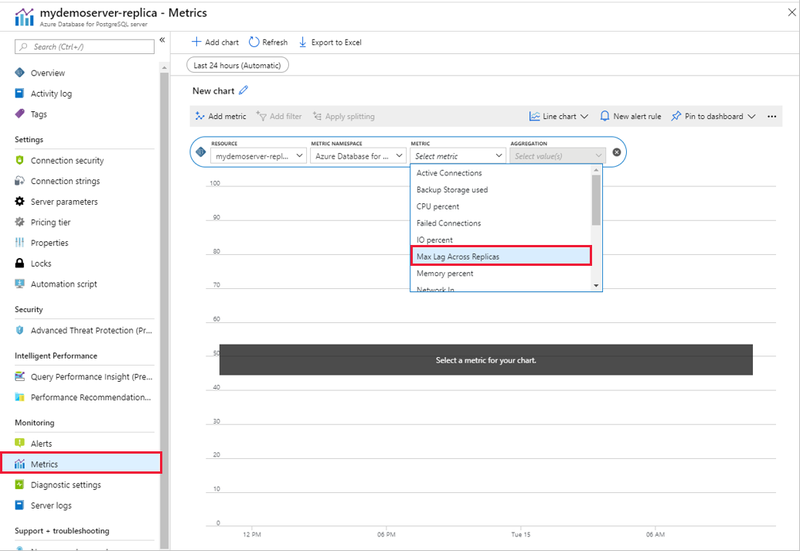 In the Azure portal, these two steps are encapsulated by a single button, Enable Replication Support. In the Azure portal, select the existing Azure Database for PostgreSQL server to use as a master. On the server sidebar, under SETTINGS, select Replication. Confirm you want to enable replication support. This operation will restart the master server. You will receive two Azure portal notifications once the operation is complete. There is one notification for updating the server parameter. There is another notification for the server restart that follows immediately. 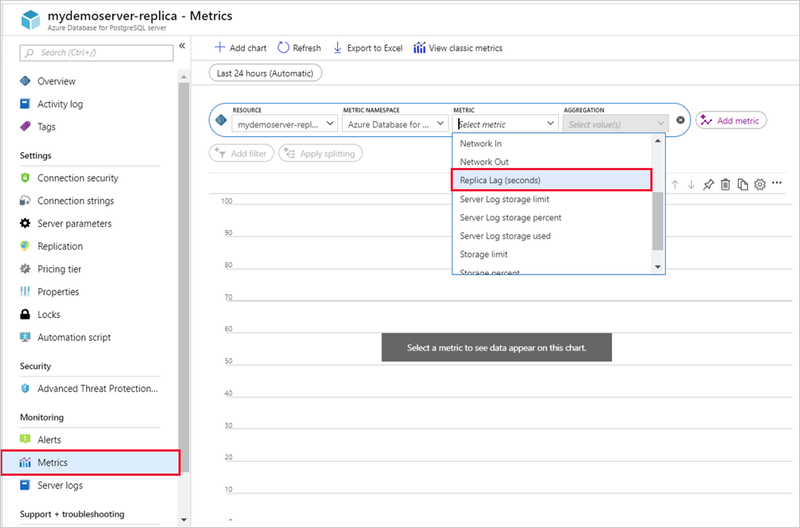 Refresh the Azure portal page to update the Replication toolbar. You can now create read replicas for this server. 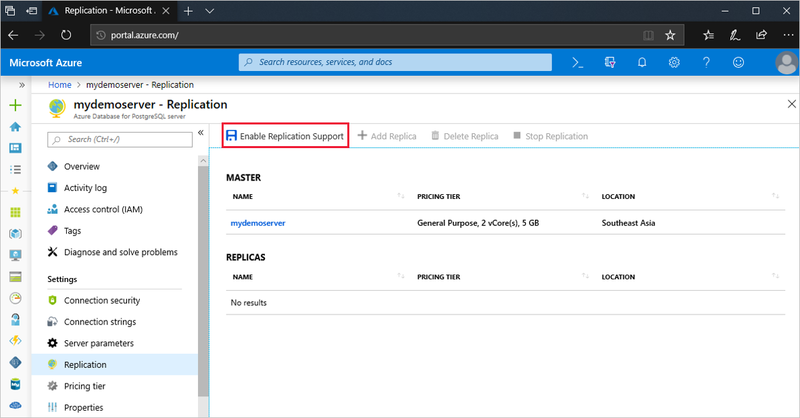 Enabling replication support is a one-time operation per master server. A Disable Replication Support button is provided for your convenience. We don't recommend disabling replication support, unless you are certain you will never create a replica on this master server. You cannot disable replication support while your master server has existing replicas. Select the existing Azure Database for PostgreSQL server to use as the master server. Enter a name for the read replica. Select OK to confirm the creation of the replica. A replica is created by using the same server configuration as the master. After a replica is created, several settings can be changed independently from the master server: compute generation, vCores, storage, and back-up retention period. The pricing tier can also be changed independently, except to or from the Basic tier. You can stop replication between a master server and a read replica. After you stop replication to a master server and a read replica, it can't be undone. The read replica becomes a standalone server that supports both reads and writes. The standalone server can't be made into a replica again. In the Azure portal, select your master Azure Database for PostgreSQL server. On the server menu, under SETTINGS, select Replication. Select the replica server for which to stop replication. Select OK to stop replication. 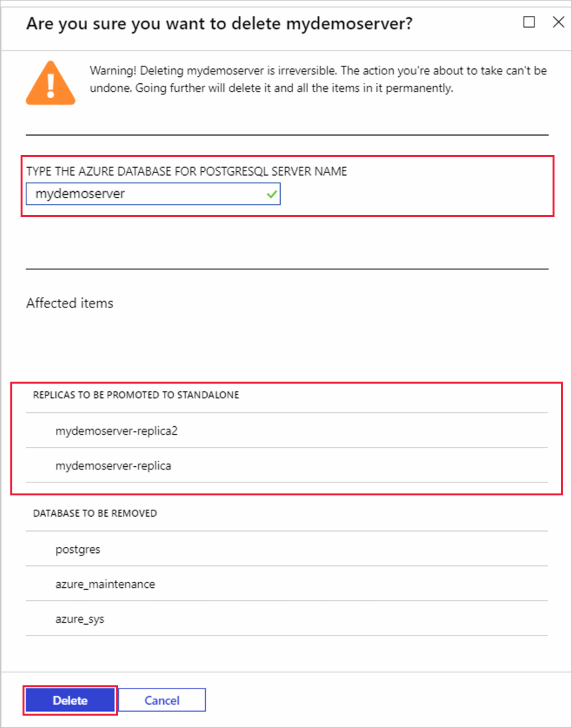 To delete a master server, you use the same steps as to delete a standalone Azure Database for PostgreSQL server. When you delete a master server, replication to all read replicas is stopped. The read replicas become standalone servers that now support both reads and writes. Open the Overview page for the server. Select Delete. Enter the name of the master server to delete. Select Delete to confirm deletion of the master server. You can delete a read replica similar to how you delete a master server. In the Azure portal, open the Overview page for the read replica. Select Delete. Select the read replica to delete. Enter the name of the replica to delete. Select Delete to confirm deletion of the replica. Two metrics are available to monitor read replicas. The Max Lag Across Replicas metric shows the lag in bytes between the master server and the most-lagging replica. In the Azure portal, select the master Azure Database for PostgreSQL server. Select Metrics. In the Metrics window, select Max Lag Across Replicas. For your Aggregation, select Max. The Replica Lag metric shows the time since the last replayed transaction on a replica. If there are no transactions occurring on your master, the metric reflects this time lag. 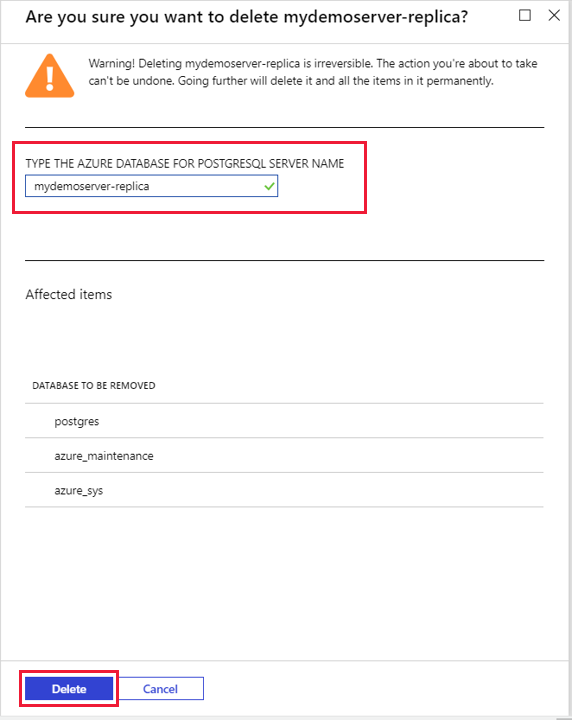 In the Azure portal, select the Azure Database for PostgreSQL read replica. Select Metrics. In the Metrics window, select Replica Lag. Learn more about read replicas in Azure Database for PostgreSQL.